My first (and only, hopefully only) experience with being challenged at Customs involved a package I was asked to bring from Paris many years ago. I witnessed it being packed, and it never occurred to me that I’d be stopped because of it. Nor that a 20 something with a mysterious package would raise suspicions. When challenged by the authorities at immigration, I was honest about the contents. The questioning escalated. Perhaps they were giving me a chance for a reduced prison sentence by confessing. When the increasingly hostile Customs inspector finally unwrapped the package, his horror was palpable as smelly juices ran all over his work station. Offensive, indeed. Everyone talks about sardines, but let’s be honest. Other than the food-loving readers of myMEGusta, I’ll wager that most people who use this phrase, particularly when referring to the NYC subway system, have never personally opened a can of sardines. And that’s a shame, because these little fish are loaded with vitamins, minerals and omega-3s, and they make for a quick, delicious lunch, especially if partnered with some crunchy bread. Parisian bistros offer them (yes, out of the can) as the first course in prix fixe menus, and “artisanal” canned sardines are to be found at tony food stores here and in Europe. 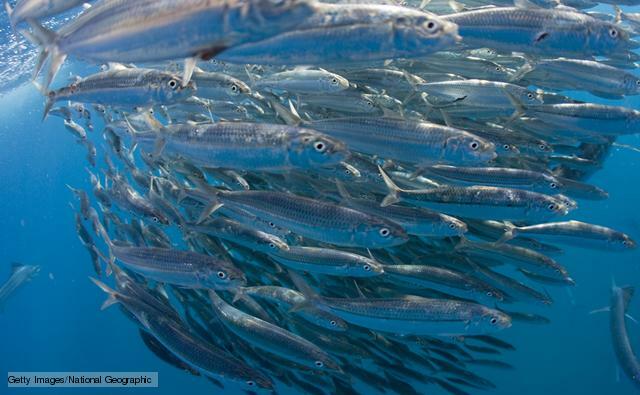 Named for the Italian island Sardinia, the true sardine is a small type of pilchard, a fish more widely known in Europe. Sometimes, the least expensive canned “sardines” in supermarkets are really little herrings or sprats, but tasty all the same. They occasionally show up fresh at the fish market, and are a treat on the grill, with a little salt and pepper, maybe olive oil. Another classic within our grasp is the famous Sicilian pasta con sardo, made of fresh sardines (although good quality canned will work just fine), raisins, fennel and other ingredients depending on who your a) cookbook author or b) Sicilian grandmother is. Well, Mary Ellen, you’ve gone from the ridiculous to the sublime. Okra, the subject of your last post, is the one food that grosses me out, but I loooove fresh sardines! Even though my family is Sicilian, I am not familiar with pasta con sardo. It wasn’t on the menu in our town. But you better believe I’m going to look up a recipe and try it. It sounds great! 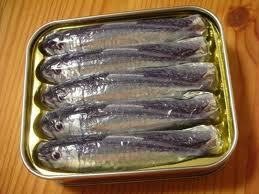 Sardines appeared as appetizers on the menus of luxury hotels in Europe. When I worked at the Beau Rivage in Geneva sardines were on the menu. In Sweden the little critters were called Stroemling and appeared as hot and cold as appetizers on the menu of the Grand Hotel Stockholm. 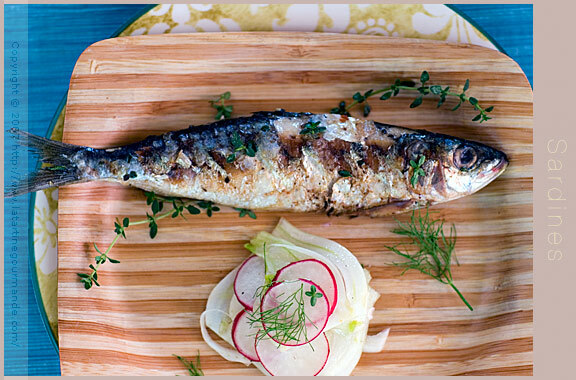 Salted sardines are wonderful because their flavor is so much concentrated. Explorers have been known to survive on canned sardines. Hurrah for sardines! Another food my mother served. I haven’t thought about sardines in years but we used to have the canned variety in sandwiches (made with toast!) for lunch occasionally on Saturdays. This memory makes me want to try them again. Thanks for the reminder. Glad Bob posted the message about your food blog. Wonderful reads. I’ll pass along to my hubby, the true foodie and chef in our home. However, since I like Lula am reminded of the ‘yummy’ sardine sandwiches eaten as a child, and which today I still enjoy, thought I’d share a funny sardine story. Back in the early 1970’s, I did a month course at Outward Bound in Maine. One of our sails involved being out sailing on the boat for a few days. (no land, no stove) The only rations to choose from were canned: sardines or spam. Of the dozen of us crew, I was the only one who would eat the delicious sardines. Imagine, LOL.